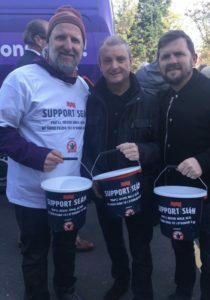 Liverpool fans dug deep as volunteers were out in force by holding bucket collections to raise money for Sean Cox at the weekend. The Irishman, who sustained life-threatening injuries following an unprovoked attack before the club’s Champions League clash with Roma at Anfield in April, is still in hospital following brain surgery and is only able to say very few words. He still cannot sit up or walk as of yet. The collectors, who stood outside every stand of the ground before Liverpool’s Premier League fixture against Cardiff on Saturday, sported specialised T-shirts and buckets that read ‘Support Sean’. More than €150,000 has been raised so far for Mr. Cox, with Everton FC right back Seamus Coleman and Liverpool manager Jürgen Klopp each donating €5,000. Former Liverpool FC chief executive Christian Purslow also donated £5,600 to the cause. The people behind the collection say they will announce the total sum generated next week. 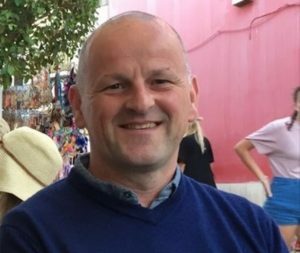 Organiser and member of The Spirit of Shankly fan group, Sam Armstrong, told JMU Journalism: “We’re just trying to raise as much money as we can really for Sean Cox. “Sean was horrendously attacked and what’s come to light recently is that it’s going to be a long road ahead for Sean to get any kind of recovery. “Friends of Sean’s in Ireland have started a Go Fund Me page to raise up to two million euros that they’re needing to supply ongoing support for Sean. Participants of the fundraiser met at the Twelfth Man Accommodation at 11:30am on Saturday morning and stood outside the stadium’s turnstiles and stands until kick off at 3pm. When asked about future events, Mr. Armstrong said: “There’s so much money involved that we’re not going to collect it all today. It’s not going to happen, we know that, but we’ve been working with the club to try and think of other ways to find the funds. Liverpool FC told the organisation that they would match the day’s raising efforts pound for pound, as well as holding auctions and raffles to further support Sean. To donate to Sean Cox’s cause, you can visit the Go Fund Me page here.